From the waters, Casablanca unveiled itself one color at a time as the sun rose. 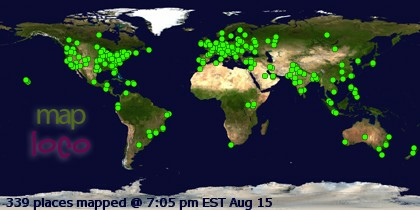 The first green to appear was military. The first orange, on a billboard advertising cellphones. Then, a rose colored minaret pierced the dull air. The streets were dotted with black (the color of choice for Muslim women). But the Moroccan women were rather non-commital in their dress, as if undecided whether to be Muslim or western, or both, or neither, or something in between. The men had clearly decided – Nike sweatshirts and denim jeans. 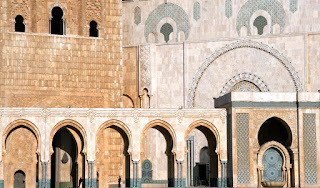 Anyone arriving Casablanca by sea would be torn between two first impressions. A filthy port city, like any other filthy port cities in the world. Or, is it Mecca??? Well, it’s not Mecca, but it IS the largest religious structure in the world outside of Mecca. The Hassan II Mosque, completed in 1993, majestically commands the coast and dominates the city, defining Casablanca better than any movie that was never actually filmed there could do. It is a spectacular monument, whose vastness and space are as striking and impressive as every inch of detail and decoration. Crossing the tiled courtyard (capacity: 80,000) on foot is like setting out in a rowboat to cross the sea. 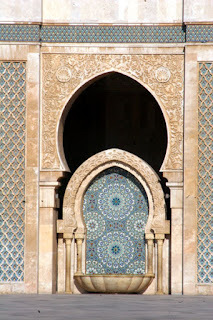 Speaking of the sea, the waves crashing the shores surrounding the mosque were no less impressive, adding blue to compliment the blue tile of the stunning mosaics of the Hassan II mosque. Created by over 6,000 traditional Moroccan artisans, each small piece is insignificant in itself, yet part of a greater design which, without that piece, would not be whole. Islamic religious art makes perfect sense. There are no dark dreary oil paintings, no bloody crosses, no shrines with elephants or monkeys, no statues, no icons of saints. Living beings are divine creations, already perfect, thus they cannot possibly be improved upon by art. 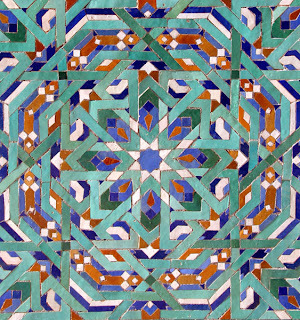 Rather, the art adorning mosques consists of geometric patterns, intricate designs with no beginning and no end, providing space for contemplation, prayer, meditation (whatever one chooses to call it) upon the infinite nature of the true Divine without distraction of idolatry. Now that’s religious art in purest form - universal. 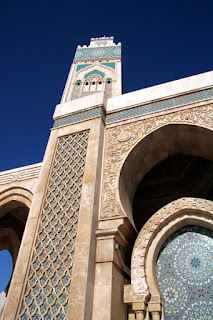 While traditional religious art form adorns the Hassan II Mosque, there are also some rather impressive modern touches. Heated floors, electric doors, a sliding roof, and, from atop the tallest minaret in the world, a laser beam which shines through the night sky toward Mecca. 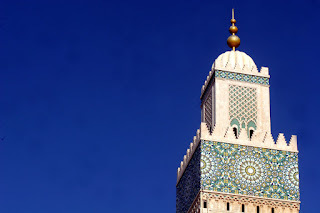 The entire construction was completed in less than a decade, and many say the Hassan II Mosque will earn its place as one of the modern Seven Wonders of the World.